Some of you already know who Doodle is. . .Doodle is my Father, he died in 1991 and I still miss him dearly. But, as the old saying goes "time heals all wounds" and although I miss him still terribly, it no longer hurts and aches as it once did for him to be gone. But lately I have found myself thinking about him alot and specifically about a certain thing that he loved to do. In fact, just tonight at dinner Mom and I started telling stories about him to Lizzy and I said "you know what I would dearly love to hear him say just one more time?" and instantly my Mom knew what I was going to say. . .
"I aint doin' nothin', just hangin' around" followed by a ridiculous laugh. I have found myself asking Monkey "What ya doin' Craz?" when she is acting silly. And somehow I expect her to come back with the rest of the bit. (the "What ya doin' Craz?" part was usually my part and Doodle would follow with the rest. Although he was known to just do the whole thing himself). So tonight in an effort to satisfy this desire of mine I got online and tried to find a clip of good ol' Crazy Guggenheim. I did find a few clips but not the one that was Doodle's specialty. Even though it is not the right one, I decided to share a little "Craz" with you all tonight. It is not sophisticated humor by any means but I hope you will enjoy it for what it is. Have a great day tomorrow. And take a few moments from your day to remember something silly about someone you love! It just feels good!!! Our household got up early this morning and put on our "glad rags". It was a big day for my best friends Rooster (or Ruthie as some like to call her) and John. Today was the day their only daughter would be married. (Boy oh boy do I remember the excitement and stress of such a monumental day!) We were all excited and happy for the whole family and couldn't wait to be a part of it. Rooster and John used to be our neighbors. We became the dearest of friends thanks to our youngest children, Johnny & Lizzy. Big John tells the story that Lizzy showed up at their front door shortly after moving in, wanting to know if they had any kids her age that she could play with. Lizzy was about 5 or 6 at the time and was known to disappear from our home and show up at other people's homes. John told her yes, they had a son her age but wanted to know where her Mommy was. (John likes to embellish this part of the story by saying that Lizzy explained that I was home "sleeping it off" on the couch!) The two kids played and I got to meet John and Ruth and that was about it. But Lizzy just loved going over there and her and Johnny became inseperable. I was pleasant and waved and said hi to the parents but that was about it. I figured Ruth and I could never be friends. After all she was one of those "good" moms that had scheduled crafts etc. for her kids to do daily. I was way too busy working etc. to do such things. Then one day I saw her outside smoking. Hmmmm. . . maybe we could be friends? Maybe she isn't so perfect? So we became more and more friendly and the rest is history. Meanwhile the kids had been friends for a couple of years by now, and played together daily. Lizzy was 2 years older and taller than Johnny, and frankly she kind of bullied him around a bit. Those two kids were complete opposites (in more ways than just the obvious gender difference). Johnny was shy and quiet, Lizzy was very outgoing and loud. Johnny was gentle and kind, Lizzy was rough and a little bit rotten. But none of this seemed to matter to either one of them, they just loved hanging out together. We all figured they would be the closest of friends forever, but then the unthinkable happend. . . Pueberty! That changed everything. Although they were still friends, it wasn't the same and it wasn't an everyday kinda thing. 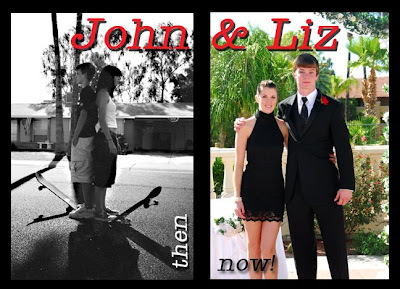 By the time Johnny got into middle school and Lizzy was a freshman in HS Johnny was starting to pass her up in height. Occassionally they would still meet out front in the street with their skateboards and hang out (did I mention Lizzy was a tomboy when she was younger?). One day they were out there and I knew it wouldn't be long before I would not have the chance to get a photo of the two of them together and I took one of them back to back showing that Johnny was finally the taller one. Last week Rooster and I were talking on the phone about the wedding and she said that she really needed to get a more recent photo of the kids together at the wedding. So today I made sure I took my camera so that we could make this happen. How FUN it was to see them together again. Johnny is now "John" and it a GIANT!!! Look at the picture below, Liz has on 4inch heels and is 5'8" without them. This makes her about 6 foot tall. Now look at Johnny next to her! They are still very opposite, Johnny (he will always be Johnny to us) is still quiet and reserved and Lizzy is still not! But there is one thing they both have in common. . .they are both GREAT kids! It is crazy how times like this you realize how fast time goes by. At the wedding I got to see alot of the kids' friends from HS (Bryanna and their daughter are the same age) some of our old neighbors and other friends we have in common. It was a wonder day and a beautiful wedding! WOW! What a great Wednesday I had today! Makes me very thankful and will make laying my head down on my pillow tonight easy (which I am going to do right after this!). Lizzy was unexpectedly home ALL day today! That just never ever happens. Mom had things to do in town, so it was just Lizzy, Monkey and myself around the house today. The thing I hate most about my girls growing up is them not being around all of time. I really miss just hanging out with them doing nothing but just talking and laughing. So to have her home all day was just short of heaven for me. She decided she would be cooking dinner tonight for the family (and Richard) and she picked the menu. She had picked up some recipe cards this weekend while she was out with her sister and wanted to give them a try. One of them was a chili & cornbread bake. Instead of using the recipe, she used the idea and made my chili and cornbread and put them together. Once Monkey went down for her nap I taught her how to make my homemade chili, and we got it slow cooking. Then she ran out and got us pizza for lunch - yum! Her and I sat on the couch eating pizza and watching "What Not To Wear" and reading the new issue of Martha Stewart Living while Monkey took a good, long nap. Once she woke up we juat had too much fun playing with her. She was super lovey today - lots and lots of hugs and kisses! She was just overflowing with them today - so much so that she was kissing the photos of us! It was just sweeter than sweet. Then when her Mommy came to pick her up it was time for group hugs (you should see a 14 month old instigate a group hug!) and of course lots of loving for that Grandpa of hers when he got home too. Soon enough Bryanna and Monkey were on their way home and it was time for Lizzy to finish up dinner (with a little guidance firn me). She got it all in the oven and started on another her new recipe cards for and old fashioned apple crisp. She had a little "creative opportunity" while making this (that is code for a mistake) but it still turned out good. While she was cooking I found myself looking around the room and realizing what a lucky woman I am! There was my handsome and wonderful husband across the room on the couch, chiming in every once in awhile. Lizzy's boyfriend, Richard was sitting at the kitchen table being very engaged as he visited with us and worked on Lizzy's laptop. My Mom was sitting at the island with me trying to keep up with the fast paced bantor that was flying around and of course there was Lizzy in the kitchen cooking. The only thing that could have possibly made this evening any better, would have been to have had Bryanna & Darwin & Monkey here with us. How blessed I am! We all piled into the nice dining room for food and laughs - and trust me there is always plenty of that when Liz is at the table! Ever since she was a little girl it was as if the dinner table was her own personal stage to perform at! I just ate it up - the food and the fun. I know all of this sounds so simple, but these are the things that fuel me. The things that make me just feel alive and well. I hope you had a day (simple or extravegant) that fueled you and just made you smile! I have just been so busy I have not taken the time to sit down and write on my blog! But today I swore I would do it before I went to bed. So, what has been going on that has kept me away so long you ask????? Let's see. . . I have been cutting paper and preparing kits for my classes. That takes alot of time. Of course I also taught on Saturday. Fun class! I wish you all could have been there. I was teaching the Playtimes Past Accordion book. Everyone's book turned out adorable! 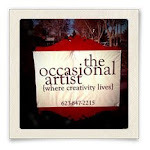 Of course it was made with one of my favorite new paper companies, Graphic 45. I just love everything about their lines of papers! Gary is doing that new work-out routine called P90X. It is HIS work-out, but it has become a work-out for me as well, trying to prepare and shop for all of his "special" dietary needs! I have been shopping and preparing for Christmas as well. It is my goal to be completely done shopping by Thanksgiving Day! I am proud to announce I am on my way to obtaining that goal. It feels so good! I have also been working on learning more about my camera. It is fun and a chore all at the same time. I have had some success with it but even more failures! I guess that is the only way to learn though? Last Tuesday was my oldest daughter, Bryanna's birthday. She turned 26!!!!!! How on earth did that happen? She kept saying she didn't want to celebrate her birthday, that she felt old. Poor baby, what does she know about being old? If she is getting old I want to know what is happening to me! Speaking of getting old. . . remember a couple of weeks ago I told you that I had become the proud owner of my 1st pair of bi-focals? Well, I took them back. They drove me INSANE!!!! So now I am the proud owner of TWO pairs of glasses. But never fear - I am going to stay in that "old lady" category even without them. I am on the look out for some super cool chains for my glasses. Still, in that "old lady" vein, I have been busy with my adorable granddaughter. Man, is she smart, sweet and cute! Bryanna took Friday off before her birthday and us three girls had a day together. We took Monkey to the new children's museum downtown. That was very fun. Monkey just loved it!!! Then we went out for Mexican food and did a little shopping. Then we went out for ice cream and then back to their house to just hang out and play. It was a really great day. 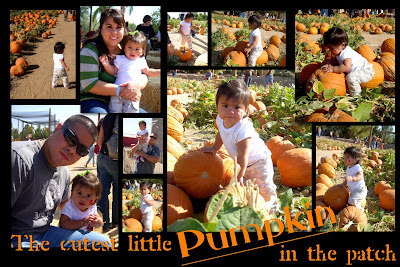 The next day Bryanna's office had a party at a local pumpkin patch and they took Monkey with them. I was really jealous cuz I wanted to go too. But I made them promise to take lots of pictures for me. Below are a few of what they took for me. I put together a little collage for Bryanna to use as her screen saver at work. Of course it is now my screen saver too. So, thati s pretty much what has been keeping me busy lately. I hope you all are having a great time and enjoying the change of seasons! I decided to post the recipe for the baked apples for you here after getting some requests for it. I hope you will give it a try. It is a great Fall recipe and makes a great presentation. Besides that, it's just plain yummy! In a small bowl mix up sugar, spices, raisins and butter until it all holds together (I use my hands for this) Then fill the apple (where the core was) with the sugar mixture and set aside. You can also add nuts to this if you like. In a medium pan, heat all of these ingredients together until it comes to a slow boil. Turn down heat and let it simmer while you finish. Cut flour, salt and cinnamon into shortening using 2 knives or a pastry blender until the flour resembles small peas. Add cold water one tablespoon at a time until moist. Gather into a ball and separate into 6 smaller balls. Roll one of the small balls out on a floured tea towel. 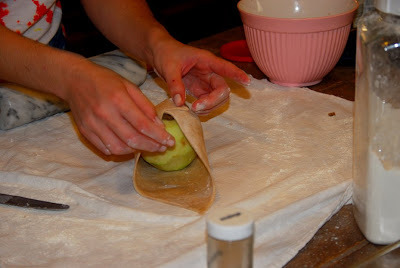 Trim the edges into squares and place a stuffed apple in center of pastry. Moisten edges with water and wrap up the apple, being sure to seal all of your edges. Repeat with the next 5 apples. Place them in a lightly buttered deep dish, making sure they don‘t touch each other. 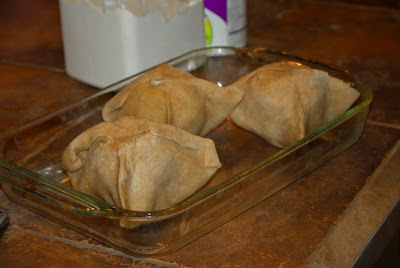 Pour sugar syrup over apples and bake in a 400* oven for 40 min. About every 10 minutes, open oven and spoon syrup over apples. Eat while hot - DELISH! You can make all of this ahead and keep them in the fridge until you are ready to bake them. Just don’t pour the syrup over them until you are ready to cook them or the pastry will get soggy. Today was a Busy, Busy day at the Gladden Casa! Lizzy had the whole day off today from School and work - that never happens! Anyhoo, she had made me promise that I would get up early this morning and teach her how to make baked apples and my granny's applesauce cake. Being the good Mom that I am, I of course said yes, and then kept my word. I was actually up way before her! We managed to get the applesaue cake done (she wanted it cupcake style) 1st. They were delicious!!!! Then we tackled the baked apples. Somehow in the move I lost my handy dandy apple corer, but we still managed to get a couple of pans of them done. I have to admit she did a great job - they looked lovely! 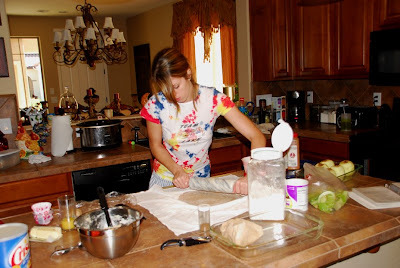 She has never really done any "home-made" cooking, but she does love to make a cake mix! I was very proud of how well she did and how well she followed directions. Along with helping her bake this morning I promised her also that I would make a big dinner, all of her choosing tonight since she would be home (and boyfriend was coming over), So I made a HUGE dinner! Roast with mashed taters and mushroom gravy, fresh green beans, broccoli, and corn! I think I had every pot in the house dirty today. We even ate in the fancy dinning room. I love eating in there. That was one thing that was a must for me when we bought the new house. Once I got the kitchen all cleaned up this morning and got Monkey down for her nap I tried to get some things accomplished that really need to get done. But that is not always easy when Lizzy is home. And that is just fine with me - I miss having her underfoot all of the time. 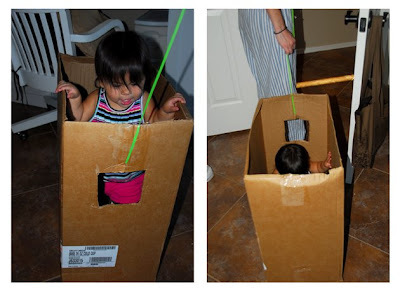 When Monkey got up Lizzy made her this nifty "car" and drug her all through the house for about an hour! Monkey loved it - she loves playing with Liz! It is probably because Liz is nothing more than a big kid herself. Once dinner and dessert was over and everyone had retired to their specific "zones" in the house I got busy again. 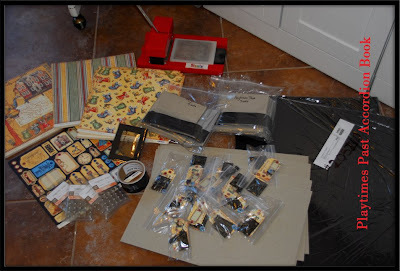 This time I got busy working on my kits for my upcoming "Playtimes Past" class. 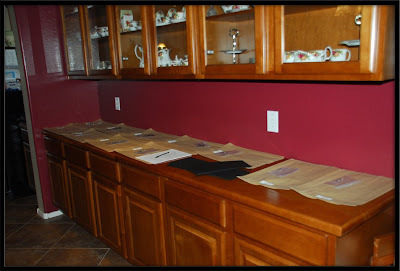 For those of you that have taken my classes, here is a glimpse at what I do to put the kits together for you. . .
All of these stacks of "stuff" will eventually be cut up, bagged up and become a kit that then becomes a treasured book once it gets into your hands! The 2 photos above are of my dinning room (after dinner) and all of my class stuff sorted out all over. I love this big table and my built in buffet. They are perfect for sorting out supplies! Between these 2 spots are 25 kits in the making! This particular book is quite paper intensive and I am really looking forward to cutting all of that paper (insert sarchasim here). Just to give you an idea of what all goes into putting together this many kits. . .
163 sheets of 12x12 papers! and some various other cuts of paper. Oh, and how about punching out all of those tags from the tag sheets. 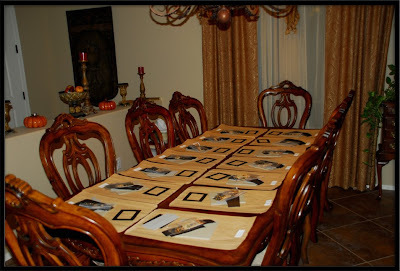 And of course there 75 Sizzix frames to cut out and a few other things that need to be taken care of. Once everything is cut and counted it gets to be time for all of the different sized bagies and the packaging up of all of the kits. WHEW! It sure is a lot of work, but so totally worth it! I really love teaching these classes at CQ! Well, tomorrow is yet another busy day! It will be just Monkey and I here together tomorrow. so I better clean up and get to bed. Can't be off your game with a 14month old running around!!!! I hope you all had a busy but fun day today and that Thursday will be just as nice for you! Hello friends - I am still around - just been busy and preoccupied! But I wanted to make just a quick post this morning as I start yet another busy day! I thought I'd show you a cute picture of Monkey that I took yesterday afternoon. I was on the phone and she was just wandering around playing, when I spied her walking past with this huge peach. She had found it on the counter where we keep the fresh fruit and just decided to help herself. This is something she has never done before. She has also never had a whole piece of fruit before - we usually cut it up for her. But she ate the whole darned thing just as it was. Later in the day we were all busy talking and we weren't paying enough attention to her and she grabbed yet another big peach! She only managed to get half of that one eaten before Grandpa took it away from her! He couldn't stand the juicey mess she was making with it. Funny how messes never bothered him when our kids were growing up! Anyhoo. . . I hope you all are having a peachey day! I'll be back soon.